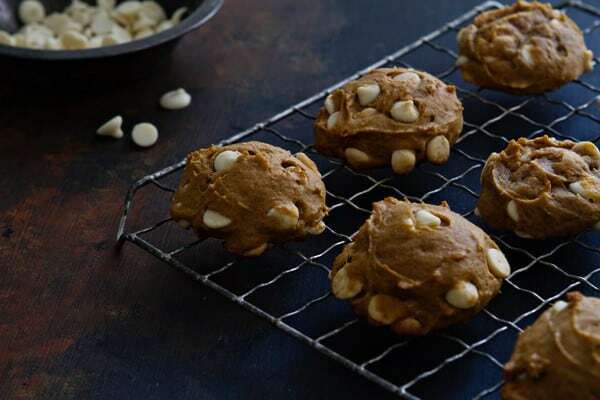 These Pumpkin White Chocolate Chip Cookies are soft, cake-like and loaded with fall flavors. When you work from home, the days all kind of merge together. I often find myself 2-3 days ahead or behind reality, but let me tell ya, I feel like I blinked and October passed me right by. Um, hello – today is Halloween – the last day of October. And the lovely Target cashier informed that there are only 8 more Fridays until Christmas. No. Stop. My brain cannot process this information. It just can’t. As much as I love the holiday season, I’m just not ready. It’s like I need another October. My step-mom called me last week and wanted me to be on the lookout for 3-foot tall My Size Elsa doll at Target. Apparently it’s already sold out everywhere and it’s on her niece’s wish-list. Wait. Sold out – already? You mean to tell me people are Christmas shopping in October? I could’ve cared less about Elsa at that moment, the girl just called me ma’am – ma’am? I have absolutely zero clue why this got to me as much as it did. I am typically not that vain to let a comment made by a 17-year old bother me so much. Maybe it’s in correlation with the gray hairs peeping through along my hairline or the beginning signs of wrinkles around my eyes. Who knows, but you better believe I grabbed a new bottle of eye cream before heading the checkout. It was even the pricier name brand kind. And it remains unopened on the bathroom sink. The one thing I have been prepared for during October is baking all the pumpkin things. Armed with a massive container of Homemade Pumpkin Pie Spice, this girl has been on a non-stop pumpkin baking extravaganza! From Mini Pumpkin Cheesecake with Salted Caramel Sauce to Pumpkin Bars with Cream Cheese Frosting I’ve done my best to give that bright orange gourd its due. Last week I posted these Pumpkin White Chocolate Chip Cookies over on Food Fanatic. They’ve got just the right amout of spice and sweetness and they’re cake-like texture is super dreamy. Plus, they’re perfect for eating your feelings after being called ma’am and buying pricey eye cream that you’ll never use. So tell me, have you started your holiday shopping yet? Fair warning, if the answer is yes, we may not be able to be friends anymore. Oh my. 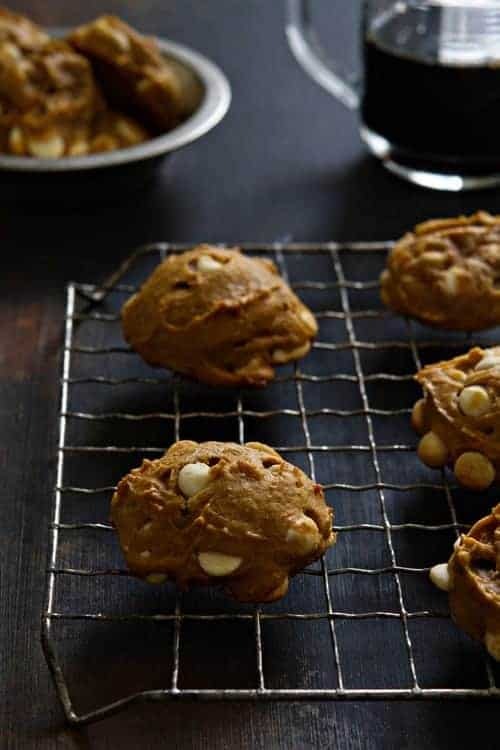 Pumpkin cookies are the best kind of cookie, and these look absolutely divine. I am pinning these for later consumption (by later I mean later TODAY). I hope you love them as much as we do! Thanks so much for stopping by! Oh Jamie, I feel you. Ma’am is certainly something I don’t like being called. I feel like saying. “EXCUSE ME?!?! I’ll Ma’am YOU!”…but I don’t, haha. So pleased you posted this recipe today! I love pumpkin and white chocolate in muffins, so I can only imagine how great they are together in cookies! Right? That’s exactly how I felt! Thanks for stopping by, Katrina! Ma’am, ugh! I don’t even like being called Mrs….I have my kid’s friends call me mom! Not sure how their own parents feel about that but oh well! My son’s girlfriend is allergic to PEANUT BUTTER AND CHOCOLATE…so I am super excited that you posted this recipe today! Now I can make something that she can actually eat, since I am all about peanut butter and chocolate! I hope you get the chance to try these cookies. Thanks for visiting! I’m whipping up a batch of these tonight! No trick or treaters in my cul de sac. :( Also, I sell Avon on the side and we have Elsa dolls and Olaf too! Message me and I’ll send a link. I don’t mind being called ma’am. I was raised in the south and taught that ma’am is a word of respect. Your cookies look so perfect. I love a thick they are! I can’t stand being called Ma’am! Not cool so I feel your pain. And I thought I was the only one who thought this month flew by so fast. Glad I got this cookie recipe to get me by! Excellent job! They look amazing! Don’t read into it, ma’am doesn’t mean your old. . It is a sign of respect, you where the customer. I am surprised there is a 17 yo still out there who says it. There is hope! Ouch! Call me ma’am and I’ll need to double the chocolate! Also, I am so not ready for November! These cookies need to happen! My kids will love them! I just came across this today! I know, I know….have I been living under a rock? I just have a couple of questions, please. I have read the instructions over and over, and I’m still confused….. In step 2, it states “In a separate bowl, stir together flour, baking powder, pumpkin pie spice, and salt. Stir in white chocolate chips.” So here’s my couple of questions, after you stir together all the dry ingredients, do you add it to the pumpkin mixture and then add chocolate chips? Or do you add the chocolate chips to the dry ingredients and then add it to the pumpkin mix? About how many delicious come out of the batch, using a medium cookie scoop? I’m sorry for all the questions! Thank you for sharing! No worries about the questions, Lilly! I’m here to help. After you combine the dry ingredients, add it to the pumpkin mixture and then add the chocolate chips. To be truthful, I think the cookies will be great no matter when you add the white chocolate chips! You’ll probably get about 30 cookies total. If you ever have any questions again, ask away! I’ve tried making some pumpkin white chocolate chip cookies, but my chips seem to sink. Did your chips sink in your cookies? These look fab by the way! Hi, Christie! My chips don’t sink in the cookies. I hope you give them a try! Let me know if I can do anything else for you! I am so happy to hear you enjoyed them. I am an avid Kroger shopper, but I don’t think I have ever purchased these cookies from there. I think the brown sugar and molasses is a great idea!